For Dr. Egli, that means patients with monogenic diabetes may be the most suitable for initial clinical tests of patient-derived stem cell therapies for diabetes. The CRISPRed stem cells may be a stepping-stone to cell transplants for type 1, but the benefit for people with monogenic diabetes shouldn’t be overlooked. “Monogenic diabetes accounts for about 1 to 5 percent of people with diabetes, so it’s not as rare as it seems,” Dr. Egli says. Dieter Egli also is an assistant professor in the Department of Obstetrics & Gynecology at Columbia University Vagelos College of Physicians and Surgeons and a member of the Columbia Stem Cell Initiative and Naomi Berrie Diabetes Center. 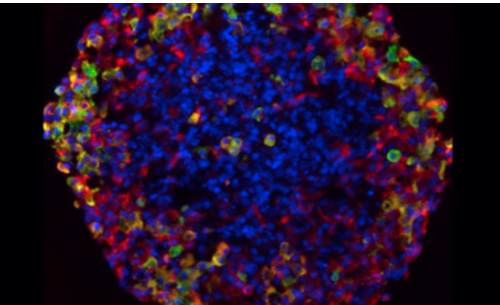 The study, “β Cell Replacement after Gene Editing of a Neonatal Diabetes-Causing Mutation at the Insulin Locus,” was published Dec. 11 in Stem Cell Reports. Other authors: Shuangyu Ma (Columbia University Irving Medical Center), Ryan Viola (CUIMC), Lina Sui (CUIMC), Valentino Cherubini (Salesi Hospital, Ancona, Italy), and Fabrizio Barbetti (Bambino Gesù Children’s Hospital, Rome, Italy). This work was supported by the American Diabetes Association (grant #1-16-ICTS-029), the Italian Ministry of Health (project PE-2011-02350284), the Russell Berrie Foundation Program in Cellular Therapies of Diabetes, and a scholarship from the China Scholarship Council.